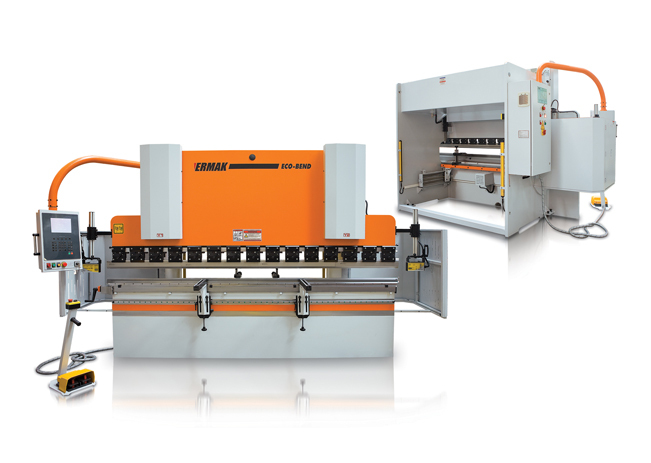 ECO-BEND EXPERT CNC Hydraulic Press Brake - G & W Machinery Sales, Inc.
CNC hydraulic press brake Eco-Bend Expert will strengthen your workshop with its low investment cost, high productivity, and economic solutions. Hydraulic synchronized valve technology with its repeatable bending accuracy helps you get same bending quality on different side of work piece. Upper beam positioning is made by linear scales with 500 times in a second and with 0,0025 mm precision rate. Single axis back gauge (X=500) system moves fast on a ballscrew shaft. Chromed and honed hydraulic cylinders keep its precision even in high tonnages. Perfect bending results are achieved repeatedly by synchronized valf technology on cylinders. 4V Bottom die allows you to make variety of bendings on different thicknesses. Easy to use and movable control unit allows operator to choose his working position. Switched side doors for your protection.